The standards for purified water are, to say the least, exacting. Which is why every aspect of your plant design is researched, tested and constructed to the highest standards. From determining the User Requirements (URS) to Installation and Operational Qualification (IQ & OQ) to the service maintenance long after the system’s commissioned, MECO integrates our services and others to deliver the optimal solution. One that’s customized to your unique specifications. Plus, our careful attention to industry standards ensures its qualification. 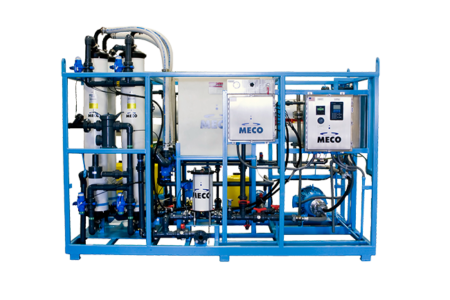 MECO’s MASTERfit™ system is designed to produce, store and distribute USP Purified or Water for Injection (WFI) in accordance with the pharmaceutical industry and cGMP requirements. The process, components and associated services incorporate proprietary state of the art technologies. 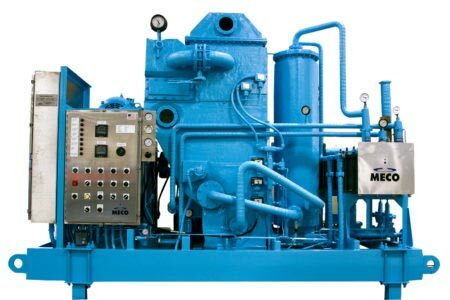 The process is relatively simple and reliable while providing the highest quality of product water. The end result is a proven design that generates savings in the time and cost associated with design, capital investment, installation, validation, operation and maintenance. 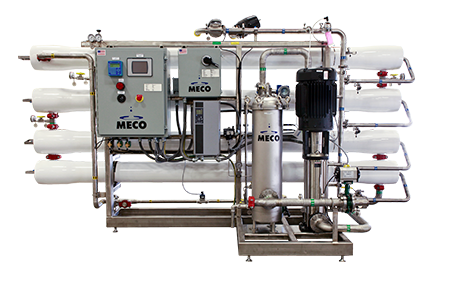 MECO’s MASTERpure™ system is designed to produce, store and distribute USP Purified or Water For Injection in accordance with the pharmaceutical industry and cGMP requirements. 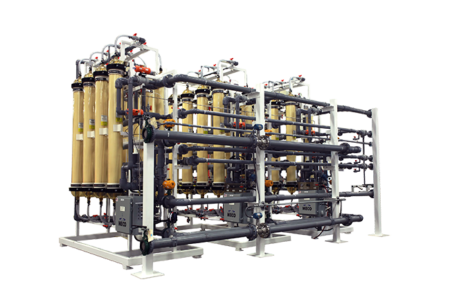 The process incorporates a patented micro and ultrafiltration technology as a first line of defense to reject suspended solids, bacteria, viruses and organic compounds before they enter the downstream components. 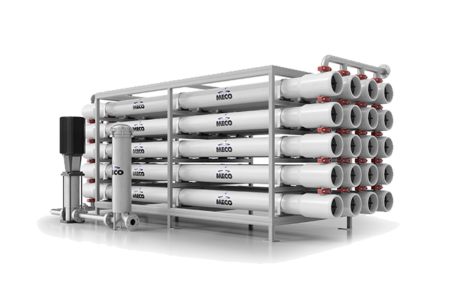 The process provides the highest level of water quality throughout the plant. The end result is a design that substantially reduces microbiological activity within the entire water system and minimizes downstream cleanings. 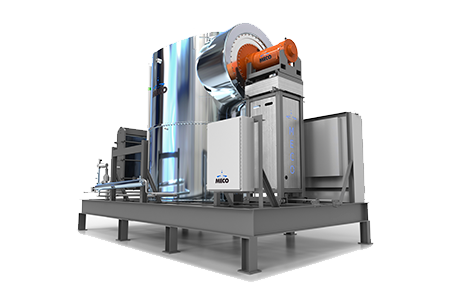 The system shown here was designed to produce USP Purified water in accordance with pharmaceutical industry standards and the cGMP. The system uses RO/EDI technology, and was built and tested to stringent specifications. 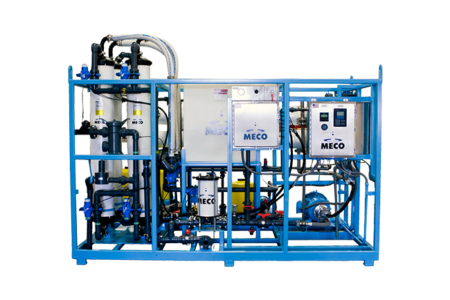 MECO’s manufacturing facility enabled the system to be interconnected with piping and cabling for factory testing prior to shipment. 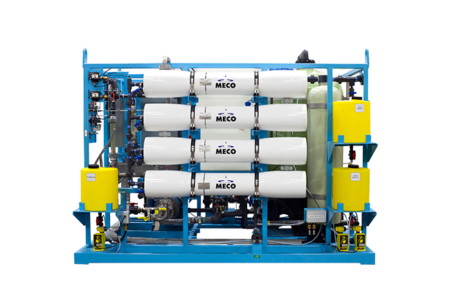 MECO RO/EDI systems generally have a low capital investment and are used where only USP purified water is required. 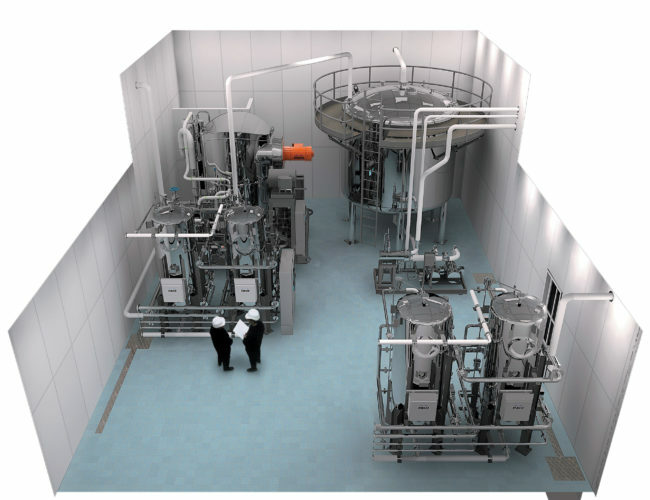 The system shown here was designed to produce Water for Injection as well as Purified Water in accordance with pharmaceutical industry standards and the cGMP. 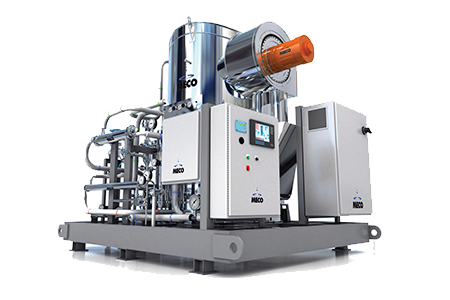 The system uses MECO Multiple Effect distillation for the production of WFI and MECO RO/EDI technology for the production of USP Purified Water. Multiple effect distillation requires a high quality of feedwater given its temperature of operation, the product of the RO/EDI system provides an excellent feed water source for the multiple effect still. 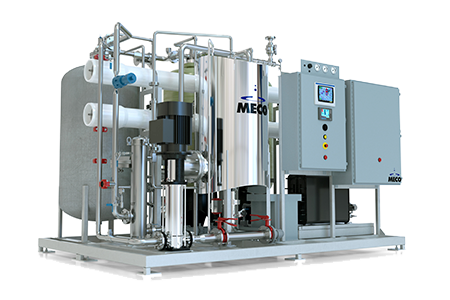 The system shown here was designed to produce, store and distribute water exceeding the requirements of the U.S. Pharmocopea for Water for Injection (WFI). A large medical device manufacturer required high volumes of WFI with a resistivity greater than 5 megohm. MECO developed the detailed design reducing projected capital expenditures by over $1MM. The system was installed and validated by MECO on a turnkey basis in less than eight months. The system was supplied with the MECO Water System Guarantee.